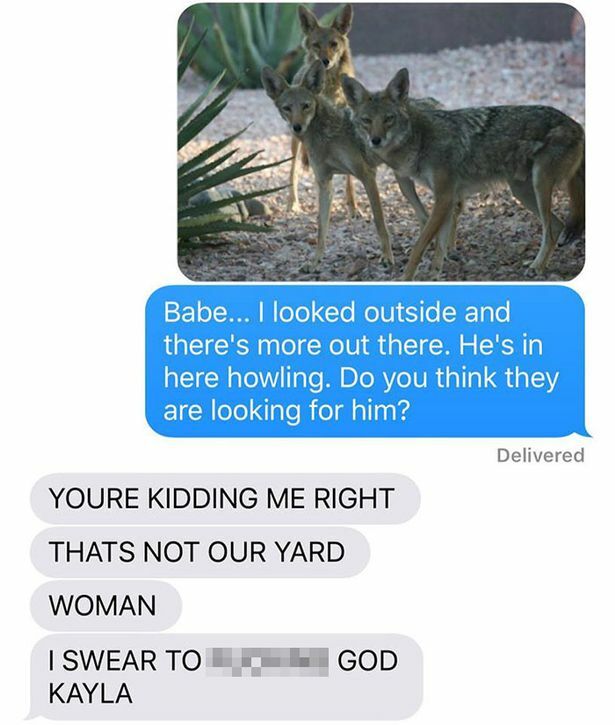 A husband’s hilarious reaction to a series of texts from his wife saying she’d brought a COYOTE into the family home has gone viral. Justin Bogh could not believe his eyes when wife Kayla Eby texted him a picture of a “cute little dog” she claimed to have found telling him she was going to take it inside because it seemed cold and scared. The picture was clearly a coyote, a wild dog closely related to the grey wolf, but his wife seemed oblivious to this fact and sent subsequent pictures of the “poor pup” sitting on the sofa with their young son at their home in Oregon, USA. A flabbergasted Justin jokingly asked for a divorce before telling his wife she was “another level of crazy” for bringing the potentially dangerous animal into the house. Things took a sinister twist when Kayla, a pre-school teacher, told her worried husband the animal was “making this weird noise and kinda pacing” and he ordered her to take their son and “go into our room and close the door”. But as Justin prepared to race home to protect his wife and child, Kayla revealed the whole thing had been an elaborate windup and there was no coyote. She started to reveal the truth to her confused husband by sending him a picture of three more coyotes, which she claimed were outside the house trying to find the one she had rescued. The rescue animal, she claimed, was howling.